Summer has officially arrived! Whether entertaining at seaside or simply throwing a beach-themed dinner party in your backyard, having the perfect serveware adds just the right touch to your get together. FX Dougherty Home & Gift has the perfect serving pieces for your warm weather celebrations this season! Mariposa Brillante serveware is recycled aluminium rendered from sand casting and then hand polished by Artisans in Mexico to reveal detailed textures. The Mariposa Oceanus Collection , characterized by stylized designs of ocean waves, bubbles and sea creatures bring the beach to your table. Pair the Oceanus Coral Spreader with the Small Oval Seahorse Server- Aqua …. a collection brushed with an aqua-colored enamel glaze, sure to be a conversation starter for any get together. The Mariposa Seaside Collection features a variety of beach-themed accents including starfishes, seashells, sand dollars, crabs and flip-flops. From the deep blue sea right to your table, these pieces are perfect for any summer celebration. Light up your backyard barbecue with the By the Sea Starfish Candle Set and serve fresh pasta salad or greens with the Seahorse Salad Servers. Looking for that perfect gift for someone who loves the beach? The Starfish Serving Bowl accented with gentle aqua enamel is the perfect gift! 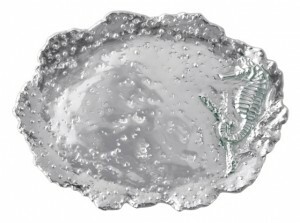 The Scallop and Shell Wine Set or the Sand Dollar Sauce Dish Set are both great choices for a hostess gift. 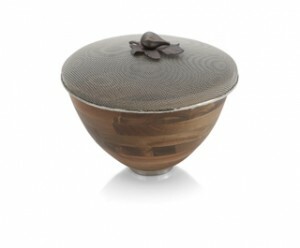 Michael Aram also offers some great serving pieces for outdoor entertaining! The Fig Leaf collection is inspired by the Northern California lifestyle where outdoor entertaining is a part of everyday life. The Fig Leaf Serving Bowl features handcrafted nickel and a mesh lid, perfect for covering food outside before serving. The Fig Leaf Kebab/Skewer Platter Set is ideal for serving shrimp and vegetable kebabs at your backyard dinner party. 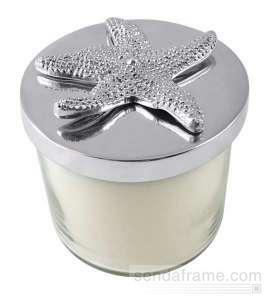 Whatever your style and preference for seaside or summer entertaining, FX Dougherty Home & Gift has you covered. Our wide variety of seasonal pieces will help brighten any outdoor party or provide a perfect gift for the beach lover in your life. Stop by our store in Doylestown, Pa or browse our online store. If you have specific questions about any pieces, please feel free to contact us by calling 800-934-3797.